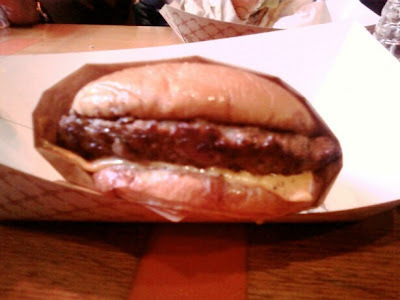 This was the second visit to brgr, and I am disappointed to report, that the wheels came off in terms of preparation. Previously, at the same (Fashion District) location, the cheeseburgers at brgr were astounding--this time, they were merely OK. The Beef: Brandt Beef sourced Chuck from California. It was a medium grind, and it tasted relatively fresh. The blend at brgr was appropriately gamy and provided a great introduction to each bite. Sadly, the beef was also bloodless, so there was no iron or overt beefiness to round out the taste. This was the same beef purveyor that was used by BLVD 16 in LA, however, BLVD 16 made good use of a fine product, where brgr wasted these ingredients with poor handling. The Preparation: They cooked the burgers to a semi-rubbery Well-Done. Gone was the tasty and flavorful sear of the previous visit. These burgers were placed on a too-cool griddle and brought to temp much to slowly. As a result, the proteins in the beef all had time to link up and create unwanted chewiness. It was too bad, because quality beef like that really deserved more respect in terms of preparation. The Seasoning: None--this was sad, because previously brgr was kind enough to care about the flavor of the dish. This time, they choose to serve unseasoned, rubbery beef. The Sear: None...sigh. 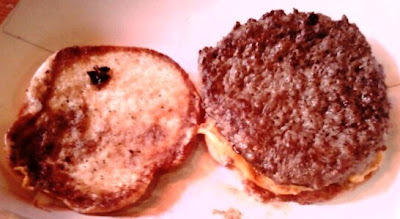 Well, there was a little, but that was scraped onto my bun from the grill and was in way associated with my cheeseburger. The Cheese: At brgr, they put the cheese at the bottom. There was an upcharge for the various cheeses, but 30 cents for a slice of American was fine. The bottom cheese would have been a strong move had the burger been properly seared. Instead, this showcased to lack of care and skill at the grill. The Bun: This was a neutral, seeded, hamburger bun courtesy of Pepperidge Farm. The bun was flabby and only toasted at the edges. The Fries: They were hand-cut, peel-on, and cooked in peanut oil. The fries were crispy and better than the burger. The Value: The value was weak at brgr. $6.50 for mediocre preparation is too much to pay for a burger in a town full of decent burgers. Burger Review : C'mon brgr--we miss you already. Fat Bruce Lee was inconsolable, since this was the death of the second 5 Bite location in a single year. The West Branch closed, and the brgr on 7th succumbed to mediocrity. Rating...2 Bites This was a substantial downgrade from the 5 bites of the previous visit. I've eaten here recently (April 2012) and it's just as bad, if not worse, as you describe. It tasted worse than a burger king hamburger, honesly.